On Children's day I woke up at 11 am. Then I was chatting with one of my Sai brother Hrithk. Suddenly a thought striuck in my mind why don't we dedicate this Children day to all our beloved Sai children who are suffering mentally or physically and decided to do parayan. All credit goes to Baba. He is the sole Doer. He plans everything. Then I discussed this with my Sai brother. 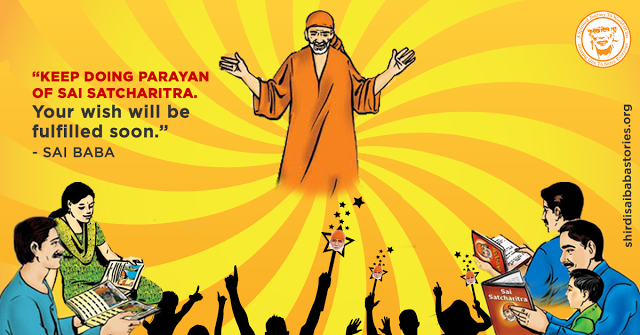 He said, “Didi it is a very good idea, let's start adding devotees. I shared this in many groups but only few people joined initially but by Baba's grace Neha didi, Pooja didi added many people and after that we got a list of more than 51 devotees. All did their parayan selflessly. It all went very good. We all were very happy to see that how He seeded that thought in my mind and how gracefully He handled everything. All my Baba's leela! Next one more experience want to share, sorry for the long post. Few days ago, after my college I was looking for an auto on the road to reach my tuition which is around 4.5 km from my college. So I got an auto and I took out my phone to listen Baba's bhajan and I saw that I was left with just " 1% " battery. So I thought if Baba is with me nothing is impossible. So I prayed Baba to show me a miracle. As I was to listen His bhajans, suddenly Baba took my eyes on the auto ceiling cover. I was shocked to see that there was a picture of Baba reee Baba mere sath hai. Then you all will be surprised to know that I put the earplugs in my ears and started playing Baba's bhajan with 1% battery which continued around 35 minutes non-stop I was listening Baba's bhajan with 1% battery and my phone was still on! How is that possible? You all can imagine around 35-40 minutes I was listening to Baba's bhajan with 1% battery. My God, I was surprised I am attaching the screenshot also. Thank you for reading. May Baba bless everyone. When our faith’s battery is fully charged then Baba makes the impossible possible, so what to speak of a phone battery? So hearing and reading Baba’s leelas are like a charger to keep our batteries charged. So let not our batteries of faith drain with obstacles of doubts, sleep, indolence or laziness. When our faith battery is fully charged we can certainly enjoy life’s every music be it harsh or melodious and thus pass every hurdle smoothly with Baba’s blessings for His children. Love You Deva. Jai Jai Ho Sai.